I am a doctor, “rejuvenating” corporate executive, entrepreneur, author, and speaker. My wife (Jill), our three-year-old daughter (Joie), our golden retriever (Sunny) – and our newborn (3-week-old) second daughter (Jae) – live in Tampa Florida and Newport Beach California (we alternate locations every month – so we travel a lot). The tradition of New Year's Resolutions goes all the way back to 153 B.C. The celebration of the New Year is the oldest of all holidays. It was first observed in ancient Babylon about 4000 years ago. In the years around 2000 BC, Babylonians celebrated the beginning of a new year on what is now March 23, although they themselves had no written calendar. Late March actually is a logical choice for the beginning of a new year. It is the time of year that spring begins and new crops are planted. January 1, on the other hand, has no astronomical nor agricultural significance. It is purely arbitrary. The last edition of this newsletter in late October focused the holidays. Did you take the actions described? Did you create a Holiday Happiness Plan? Did you go to the BeHappy101.com website every week throughout the holiday season to check out the Holiday Happiness series. If so, then, I hope it helped you have a much better, happier, less stressful holiday season. And if not, make sure to remember to use the series next year to create your happiest possible holiday season. Believe it or not, we’re already entering a new decade in the 21st century. The first decade of the new century sure went by quickly, didn’t it? It seems we were just preparing for “Y2K” (the year 2000), and now, here we are, already starting a new decade. So, what will you accomplish in the next decade? What about in the next year? Do you have some New Year’s Resolutions? What about some annual goals? Well, I’d like to take these resolutions to a higher level for 2010. Because while resolutions are great (and I definitely recommend you have some), the fact is, they are not often achieved (even though the word “resolution” has a very strong, decisive definition). There are many reasons for this, but the bottom line is that New Year’s resolutions have lost some of their meaning. It’s almost as if they’ve just become obligatory "beginning-of-the-year" dreams, with no follow-through. If you want to learn how to effectively make and achieve resolutions click here to go to the December 28th edition of the “Holiday Happiness” series. It will give you a detailed plan to create and achieve your resolutions for 2010. And for you - BeHappy! Newsletter subscribers - I want to take this a step further. I want you to do more than just make “resolutions”. 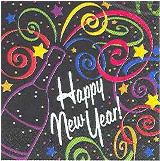 I want us to make New Year commitments to ensure that 2010 is your best, happiest year ever. Commitment: a pledge or promise to do something. Because every New Year, we have the chance for a psychological “new beginning” – a new motivation to do better, be better, and live better than we did the previous year. But let me ask you - what is your personal history of success in these areas? Do you make resolutions and keep them every year, or are you like most people, where the resolutions you make on January 1st are essentially forgotten by February 1st (or even sooner)? If you’re in the latter group, let’s make this year different – especially if 2009 was a tough year for you, as it was for many people due to the miserable economy we’ve been experiencing over the past year and a half (see the 4-part series called Eliminating Fear to Thrive in the Current Downward Economic Cycle if the economy is at least partly responsible for any tough times you may have been having this past year). Making a commitment – in other words, a “promise” – is a serious issue. It means there are no options other than to keep your promise (i.e., meet your commitment) - otherwise you are not living with integrity. Yes, it is absolute, and there are no excuses for failure! First, read (or re-read) the December 28th edition of the 2009 “Holiday Happiness” series – which is all about creating and achieving New Year’s resolutions. Access it quickly by clicking here. By following these action steps for the next 60 days (essentially January and February) you will be amazed at how much progress you will have made towards achieving your resolutions for 2010 (they will have become "commitments"). We’ll look back on this 60-day action plan in the next edition of the BeHappy! Newsletter at the end of February. Then, we’ll take more actions to get to the next level of happiness for the rest of the year (and beyond). As an official Health and Happiness writer for Examiner.com, there are new articles posted there every week or two. These articles are typically less in-depth than the articles here at BeHappy101.com, so you can use these as quick summaries of certain topics related to happiness. Check it out by going to BeHappy101.com and clicking on the Examiner.com link just below the "Thought for Today". BeHappy! at Work free e-book: The free introductory version of “BeHappy! at Work” was launched at the end of October. 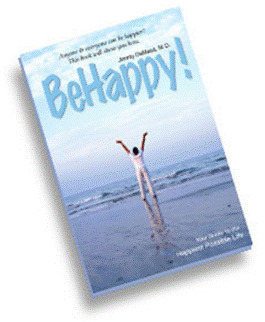 Since you are already a subscriber to the BeHappy Newsletter, you should have received an e-mail with instructions on how to get your free copy. If you didn’t get yours, be sure to download it now. PLEASE tell your friends to subscribe so they’ll get a FREE copy, too. A new E-Coaching opportunity: get personal, private coaching from me - all electronically (by e-mail) with this new, effective part of the BeHappy! system. I have added a FREE introductory coaching session to the offering so you can try it out first, with no risk or obligation. The new "tour" component of the website is still under construction, which is intended to help you get the most from the behappy101.com site on a regular basis (to be finished early in the New Year – it’s one of my resolutions!!). This "tour" will provide you the ability to navigate the entire website easily based on whatever interests you - or whatever you need in your life to be happier and more fulfilled. The popular Thought for Today: a feature on the site initiated February 1st which has provided a new thought every single day since then. Each new Thought for Today gets posted on the behappy101.com homepage every morning (365 days a year) between 5:00 a.m. and 6:00 a.m. (unless I sleep in – then it might be 6:30 a.m.). These are thoughts to help start your day off right. The thoughts are generally about happiness, success, relationships, money, etc. So go to the website everyday for a new “thought”. You’ll soon become “addicted” – and it will improve your life tremendously.